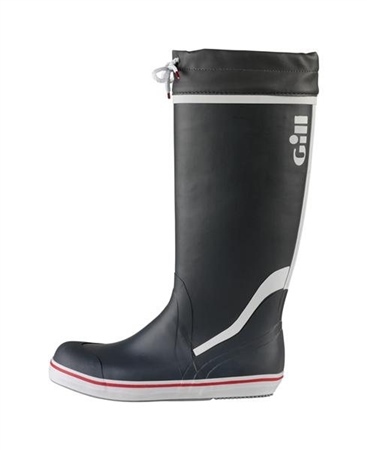 This pair of Gill tall yachting boots are made from 100% natural rubber and contain non-slip soles, quick drying lining, removable cushioned inner soles and reinforced heels and toes. Perfect for the keen sailor and good quality to boot! Bought this boot again as a replacement for the same ones which have started to leak after about 8 years of hard boating work. Ideal for warmer weather for someone with very long legs with that extra length. Worn under salopettes for colder, wetter weather provide good grip. Comfortable roomy boot with space for thermal socks. Flexible material means you can wear these all day long. Glad to have found these are still available to replace my older pair. These are my second pair. They are tall - for wading in with the dinghy - and good grip. Better and taller than most leather boots and much more economical. The previous pair lasted decade and due to cracking were chopped down to ankle boots - great value! My first pair of sailing boots. Phone and advised on correct size. They fit like a glove, are very grippy and most importantly very warm. Purchased three pairs over last five years very comfortable but they don't last long,they don't get a lot of use ,but perish and leak around the ankle area .These boots are not good value.